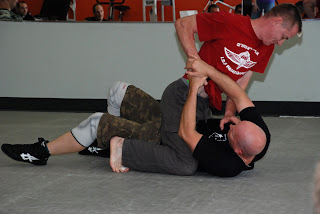 I received an e-mail the other day regarding a person who was wondering about Krav Maga and the viability of the techniques in a real situation. He, as many of us was very concerned about the effectiveness of the system. Although I feel it is a legit concern to make sure the tactics that you learn are going to be there for you in a pinch, as I read the e-mail further it seemed that this person had a perspective that many hold: 1) Always being prepared for any circumstance 2) Basically looking for a system that would give him the ability to be able to take out anyone no matter the person, situation or conditions. He described a circumstance where he was facing 6 guys at least one of whom who had a weapon. From his description he did make it out alive, hurt, but alive. He admitted that he was very lucky because they were probably drunk and he got the jump on them so to speak. I would agree that he got VERY lucky! I don’t know of any system that would protect you from this if you were hoping to pull a Steven Segal and want to take all of them out via empty handed. It seems like it is the age old quest, to be invincible. We all would like it to go down like in Bruce Lee’s “Enter the Dragon” or most any other action flick, where the hero is surrounded by numerous bad guys where upon he systematically takes out everyone of them because… well, because he is clearly waaaaaaaay cooler and can kick some major booty! That should show everyone who’s the “big boss” (The Big Boss aka Fists of Fury) right? We all know what the real answer to that is don’t we? Yes, we would like for it to be different somehow, especially for us, but alas it is the same answer: We are merely human like everyone else and although some people are more athletic and may have more legitimate skill we all have limitations. In light of this I believe that if you look at things from a slightly different perspective you can increase your odds of survival in situations that are stacked against you. The 9/11 attack on the World Trade Center was a tragic, but good example of controlling the playing field. If the terrorists would have gone toe to toe with the United States military forces in conventional warfare they would have been utterly destroyed, they wouldn’t have stood a chance. However they knew our game; didn’t play it and were able to unknowingly make us play theirs by using civilian aircraft as weapons. The result was the most devastating attack on American soil ever in our history from a foreign threat. It was a tragic day for the US; but a tactical success on the part of the terrorists. They were able to do what otherwise would have been impossible had they fought toe to toe with us. They really followed the above five principles. They identified what game the US was playing both militarily and socially, they didn’t play our game militarily and they also thought outside of the box to used our civilian freedom and trust against us by creating a tactical advantage through the use of domestic civilian aircraft as weapons to execute a devastating strike; they controlled the where, when and how of the engagement and we didn’t know what game they were playing so we weren’t able to successfully adapt and defend. By utilizing all of these strategies they ultimately controlled the playing field and the game forcing us to play the way they wanted. So how can we utilize this same strategy? First by not looking at an engagement as you would a duel (a sporting match is in effect a duel). Rather think of it as more a chess match regarding controlling the playing field (game board, tactical space etc.). It is not whether or not the pawn is tougher than the king, or the queen tougher than the bishop. It is about how you use tools, tactics, tricks and environment to give yourself the best strategic advantage to survive or conquer the situation. Only a portion of it is fighting. Unfortunately too many people are thinking about it as a duel and being able to beat the other guy. Although many great things come from sport training and it is absolutely necessary to become proficient at fighting there is so much more to it than that. If you only train in the physical aspects of a sport mentality you will only view situations as you being able to “beat” the other guy. Be a general not a soldier. There is more to the encounter than just the fight! You can be a world class BJJ athlete but if the goon has a knife and isn’t playing the sport bjj game you could be in for a big surprise: If you are a knife or stick guru and can balisong your way through even the toughest Dog Brother; that may not do you any good if the other guy has a .40 caliber, 20 feet and is a crack shot: You could be great with your pistol but find yourself in the crosshairs of a sniper 200 yds away: You could be a UFC champion and think you are going to walk straight through this goob who you want a piece of and you could, but it might be harder once you realize he has three mean and ugly brothers w/tire irons. The situations are limitless but the principle is the same. There is always a “what if.” Someone can always be younger, stronger, meaner, more aggressive, more skilled…and their all uglier! Don’t fight and if you have to don’t fight toe to toe. It is not a duel / sporting match. Simply put, your ego can kill you. There is a good video on Hock Hocheim’s site that shows a scuffle in a convenience store where one guy clearly knows some grappling. He puts the other guy in a closed guard and guillotine choke just before getting stabbed numerous times with some sharp pointy object that was found on the ground. The guy who got stabbed was clearly a better grappler and had the advantage …well up until he realized he was in a knife fight without a knife. His ego got him into trouble because he thought it was a duel/fight and he didn’t respond tactically he tried to “beat” his opponent. Incidentally he died from his wounds at the scene. Don’t let your ego get you in trouble. It is not just about the fight; control the playing field by whatever means possible using strategy which may or may not involve fighting. It is better if it doesn’t! And if you do have to go to blows; the more you control the how, where and when of the engagement the better off you’ll be. Think outside of the box, be creative. Once again be the general not the soldier. What is the difference between a fighter and a warrior? A fighter trains to fight and sometimes they learn to live. A warrior trains to live and sometimes they have to fight protecting themselves and others. What others? All others. Yes the warrior does train to fight, but the fighting is not the focus of the training. A warrior fights because he has to. A fighter fights because he wants to. A warrior fights to protect others. A fighter fights for himself. I have trained with both fighters and warriors. I have fought for myself and to protect others. I prefer warriorship over fighting. I feel it is a richer, deeper, more fulfilling path although it is more challenging. Your steps along this journey are sometime difficult to see clearly. The greatest obstacle has always been yourself. Giving and sacrifice to others over seeking self gratification is tough because we are all human and none of us are perfect. Being a warrior isn't about some belt, trophy, title, job (solder, officer, bodyguard, gladiator, etc)or any goal that we achieve, we don't ever really master it really, it is just a choice that we make every step that we take. Sometime we stumble and sometimes we fall, but warriors get up, brush themselves off and "Keep Going!" It is our actions, what we DO and our intentions behind those actions. If we ever really think we are "there" or that we "got it" we are fooling ourselves. It isn't something we get it is something that we do over and over again. You are either walking the path or you are not. It isn't a journey with an end. Only one step after the next. It is really about the practice and EVERYTHING, everyday, every moment is practice.